Apples and cherries and strawberries, oh my! Isn’t this a cutie? And it’s RED! 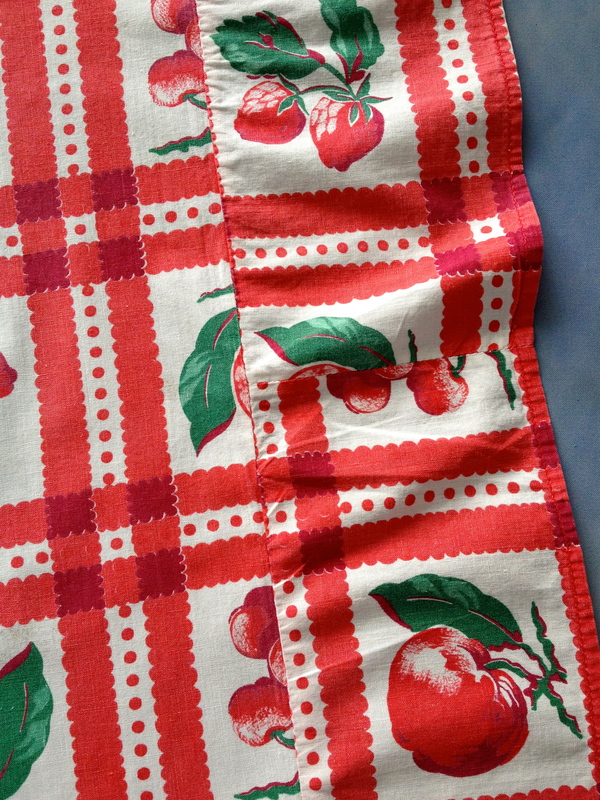 Janeray’s already done a couple of posts on the ultra small-sized tablecloths she’s found. They’re so small that, unless you’ve got a doll-sized table, they’re more like table toppers. Here’s one I just dug out of a thrift-shop pile of otherwise boring linens. Measuring a tidy little 43″ by 45″, it’s made of a tightly woven cotton percale with a wonderful all-over plaid & fruity pattern. 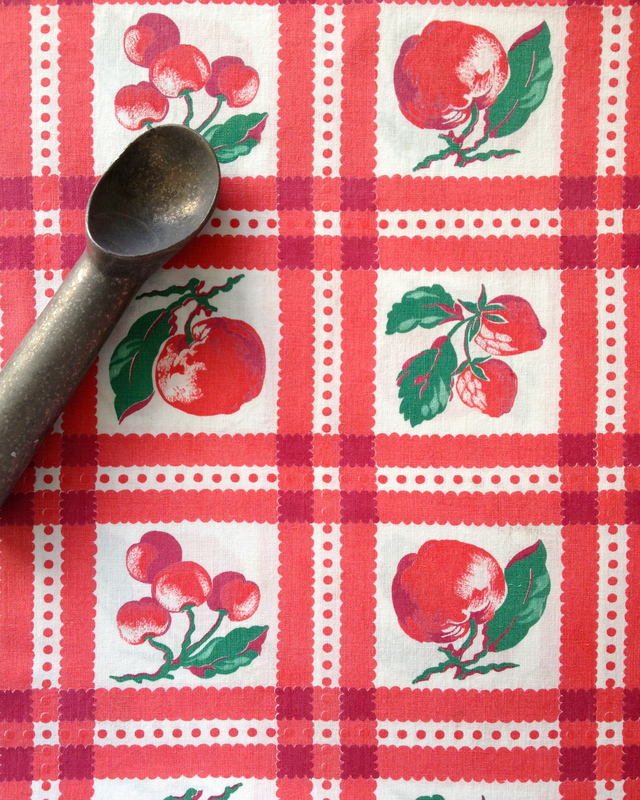 The print sure would make cheerful curtains for a vintage kitchen. Actually, I’m guessing that this tiny table topper started out life as a curtain, or as yardage meant for curtains. Two parallel sides—the straight-of-grain sides—have sewn-on strips of 4″ fabric that get it to 43″ wide. So the fabric “on the bolt” was about 36″ wide. Sounds about right for vintage yardage, doesn’t it? 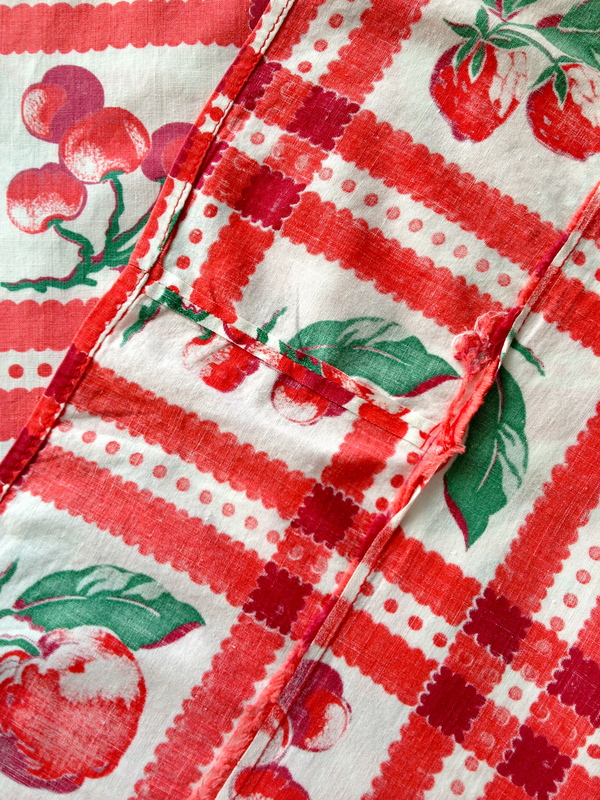 A skinny little seam there, joining the selvedge of the wide width to the cut edge of the narrow one. The maker tried valiantly to match the plaid pattern. Unfortunately, the fruit squares aren’t precisely square, so she ran into trouble pretty fast. But we’ve gotta give her points for trying! Also, those 4-inch strips are cut on the cross-grain, but sewn to the big piece of cloth on the straight-of-grain. More trouble! The cross-grain stretches, the straight-of-grain doesn’t. So those narrow strips have a completely unavoidable bit of a ruffle-y effect going on. Still, it’s a great table topper! 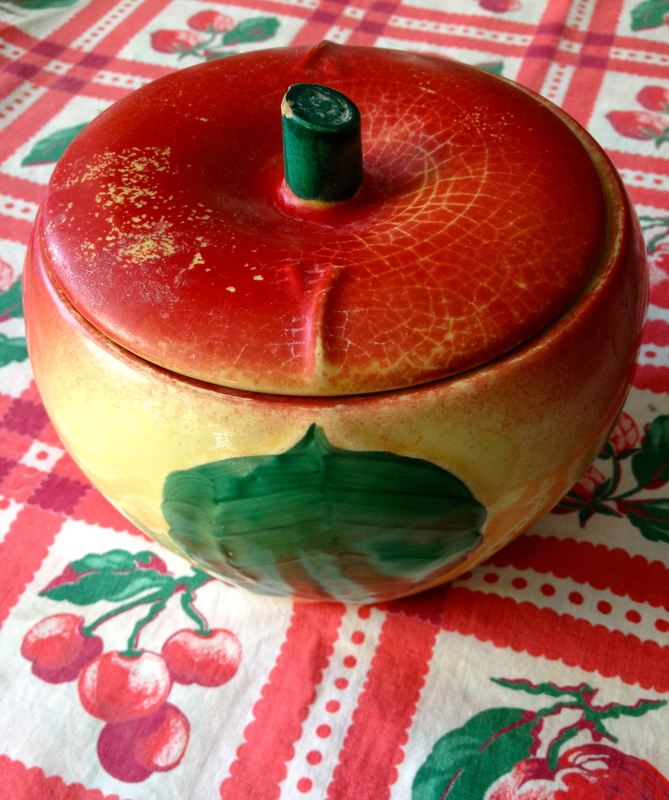 Since it’s almost apple season here, let’s pair this table topper with another good thing: a vintage pottery apple jar. You can’t see it very well here, but the green leaves—one on each side of the jar–are molded in very low relief, then glazed. Don’t you love the realistic leafy brushstrokes? It’s not marked, other than a stamped number “3” on the bottom, so I’m not sure who made it. Maybe Hull? And it’s only about five inches tall, so it seems too petite to be a cookie jar. Let’s call it a grease jar. I think the hairline cracks on the interior say “fast change of temperature,” like you’d get if you poured hot grease into a room-temperature ceramic jar. 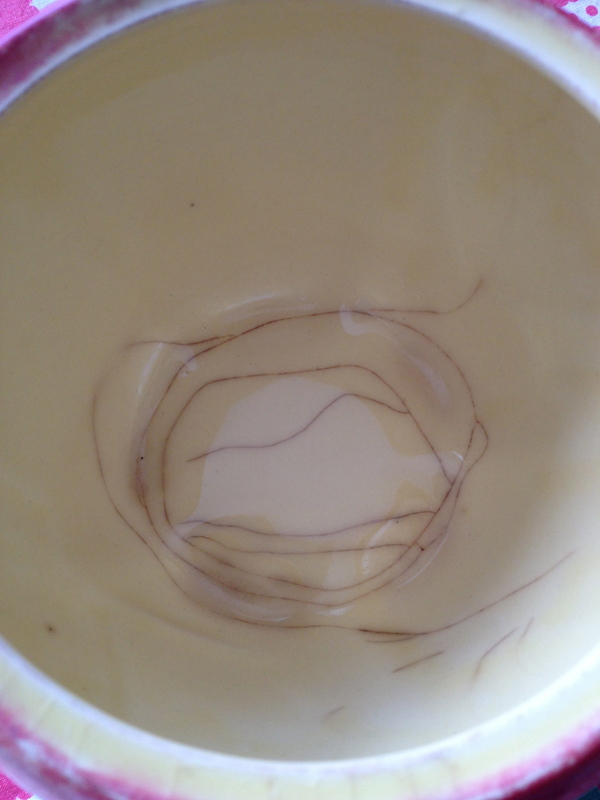 There’s lots of crazing on the lid, which adds to its charm. Great detail: the leaf stems on the lid line up with the leaves on the jar. Both the table topper and the apple jar are going to The Vintage Bazaar in two weeks! 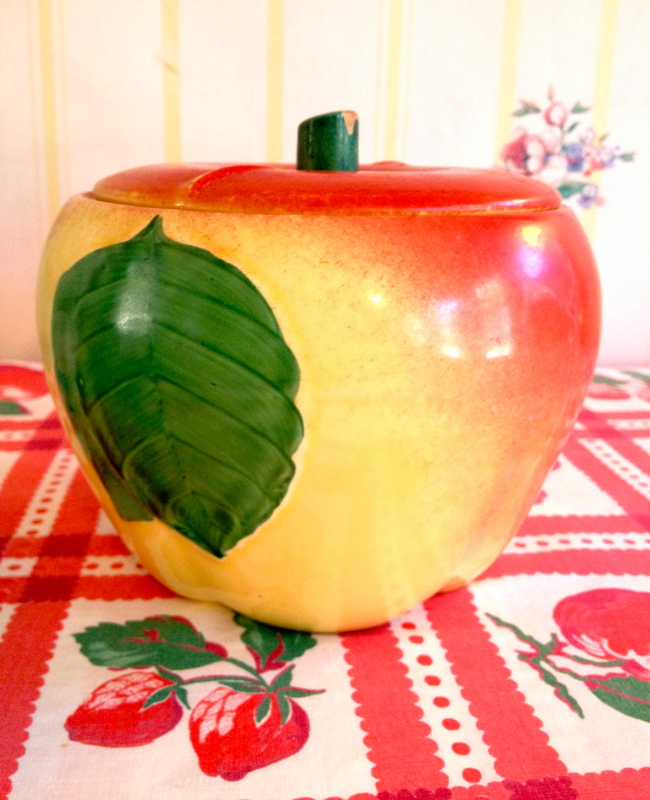 That’s a really cute apple jar!!! Yes, I thought so too! I am so tempted to keep it. But . . . it’s really gotta find a new home! I remember my grandmother having a small cloth similar to these that she used to cover the food she prepared Sunday morning before church. She would fry the chicken, cook the corn, green beans, rice & biscuits and push it all to the back of the stove. Then she would cover it with the cloth. When we came home from church, dinner would be ready, and still lukewarm. She never heated it back up and no one ever got sick! What a great story—your grandmother sounds like she was one organized lady! Was her dinner cloth printed? One of our grandmothers had a canvas cloth that she used to cover her homemade noodles while they were drying, but I think it was plain. Janeray might remember better. I remember she stored them between clean muslin sheets on a guest room bed upstairs. I’d get sent to fetch them before the water started to boil. They don’t make heavy cotton sheets like that anymore.